Harare/Brazzaville 13 September 2018 - The World Health Organization (WHO) is scaling up its response to an outbreak of cholera in Zimbabwe, which is expanding quickly in Harare, the country’s capital with a population of more than two million people. Cholera is an acute waterborne diarrhoeal disease that is preventable if people have access to safe water and sanitation and practice good hygiene, but can kill within hours if left untreated. 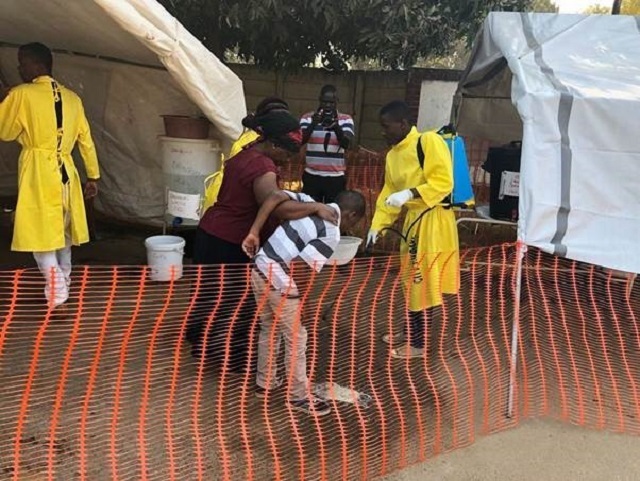 Authorities report that the outbreak began on 1 September in Harare and as of that date to 11 September, the Ministry of Health and Child Care reports that there have been nearly 2000 suspected cholera cases, including 58 confirmed cases and 24 deaths. Glenview, a high density suburb of Harare with an active trading area and a highly mobile population is at the epicentre of the outbreak. The area is vulnerable to cholera because of inadequate supplies of safe piped water, which has led people to use alternative unsafe supplies such as wells and boreholes. Cases that are linked to the epicenter in Harare have been confirmed in 5 additional provinces. The Government of Zimbabwe has declared a state of emergency and is working with international partners to rapidly expand recommended cholera response actions, including increasing access to clean and safe water in the most affected communities and decommissioning contaminated water supplies. Authorities and partners are also intensifying health education to ensure that suspect cases seek care immediately and establishing cholera treatment centres closer to affected communities. WHO is supporting the Ministry of Health and Child Care to fight the outbreak by strengthening the coordination of the response and mobilizing national and international health experts to form a cholera surge team. In collaboration with health authorities and partners, WHO experts are helping to track down cases, providing technical support to laboratories and improving diagnostics and strengthening infection and prevention control in communities and health facilities. In addition to such measures and efforts to improve water and sanitation, the government is assessing the benefits of conducting an oral cholera vaccine (OCV) campaign and WHO is deploying an expert in OCV campaigns to Harare. Cholera is a major public health problem in the African region and just two weeks ago Health Ministers from the region committed to ending cholera outbreaks by 2030 by implementing key strategies. Forty-seven African countries adopted the Regional Framework for the Implementation of the Global Strategy for Cholera Prevention and Control at the 68th session of WHO’s Regional Committee for Africa.